Are The Attractive Regatta Samaris High Rise Hiking Boots Tough Enough? 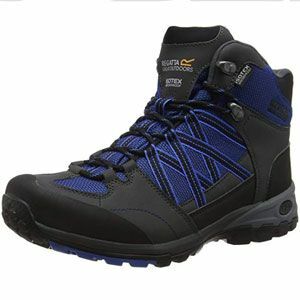 Regatta is a well-known, respected name when it comes to equipment for the great outdoors, and these Regatta Samaris Mid High Rise Hiking Boots are an attractive choice. This shoe is an affordable, high-rise option that should be able to provide the comfort and support that men need for regular hikes. They don’t immediately look like tough, everyday hiking boots, but the specification says otherwise. The walking boot boasts a strong material, water-repellent materials and a good grip. So, does it do enough to for keen hikers to wear this on every hike?